We love Apam Balik. In Malaysia, this dish has been declared a heritage food, a national treasure. The soft and light texture of the pancake, akin to Australian crumpets, the buttery sweetness of the filling, the crunch of the peanuts… Mmm! We often come across Apam Balik (Apong, Mun Chang Kueh, Martabak Manis, Terang Bulan, Kue Bandung… it has many, many local names), when we roam the multitudinous stalls of night markets in Malaysia. It derives its name from the folding of the cooked product. Sold in two delightful forms: a thin and crispy serving, and the fluffy pancake type, both are so delicious. However, the pancake-type gets our nod for satisfaction. 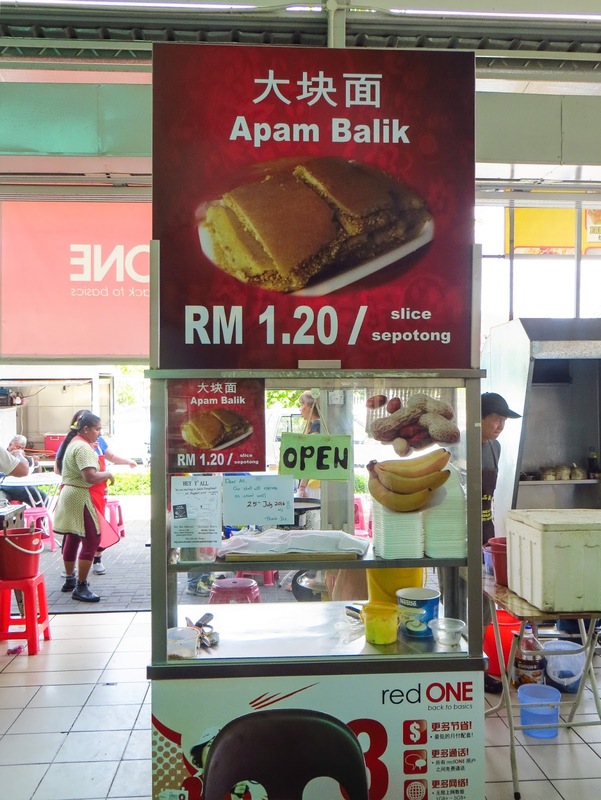 Spending much of our time in Ipoh during this visit to Malaysia, we stumbled across a stall serving a delectable version of Apam at the food-court in Taman Canning. Soft and fluffy. Sweet and crunchy. Is there any more? The owner of the stall is an energetic, young lady from Ipoh, Sandy Ong, whose staff consists of her supportive and encouraging father, Aaron Ong. Sandy is a graduate. However, her passion has always been in cooking. For this very reason, Sandy decided to follow her passion, experimenting endlessly at home with Apam Balik batters until she achieved the style of dessert which she had sought. The next step, of course, was to open a stall. 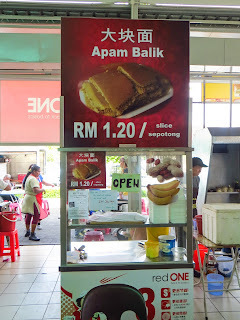 Until yesterday, Sandy’s Apam Balik stall has been located at the little food court near Pasar Taman Canning. Working from 7 o’clock until 2pm, Sandy has built up a strong following of customers in the local area. In fact, her following has been so strong that it is best to arrive well before her nominal closing time. For example, last Sunday, we arrived at 9:30. Sandy approached us to tell us that she was on her final batch of batter! Ayo… we had already missed out three times in the past fortnight… the penalty for being too late! ADDENDUM, December 2016... Sandy is no longer serving her delicious Apam Balik, a real loss for Ipoh. We wish her well in her new career.